September 24, 2014. The Syracuse Festival of Races, host of the 2014 USATF 5K Masters Road Championships, announced yesterday that three-time Olympian, Jennifer Rhines, had entered the championships with the goal of taking down the US Masters Women’s record for 5K. Their announcement can be found here: http://www.festivalofraces.com/news.html. This will be Rhines’s first attempt at breaking the 5K Masters record; she just turned 40 in July. And it is fitting that her first attempt at a 5K Master’s record comes in the area where she grew up and first became a champion high school runner in the early 1990’s. 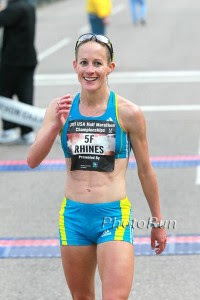 Rhines’s incredible career includes competing in three Olympic games at three different distances: 10,000 meters (2000-Sidney, Australia); Marathon (2004- Athens, Greece); and 5000 meters (2008-Beijing, China). To put it in context, the 2012 Olympics in London were the first games in the new millennium where the US Olympic team did not include Jen Rhines, an astounding fact and a tribute to her ability to perform at an elite level over an unusually extended time period. More recently she won the USA Half Marathon title at Houston, TX in 1:11:14 and was the first American woman to finish, and third overall in the Carlsbad road 5K in California that year, with a time of 15:37. Rhines joined the B.A.A. high performance team, which is coached by her husband, Terence Mahon, in fall, 2013. Since that time she has, as throughout her career, run a variety of different length races against elite fields. Rhines began 2014 with a southern trip to get in some early races in mild weather; she hauled in a 3rd place finish in the famous Gasparilla (Florida) Half Marathon in March in 1:14:39 and a few weeks later finished 20th in the Gate River Run (15K) in 52:09 in the same state. Heading to southern California at the end of March, she ran 16:03 in the Carlsbad 5K before returning to Boston where she ran in the BAA 5K (16:22 for 18th) on the 19th of April and in the BAA 10K (33:45 for 8th place) on June 22nd. Her first venture as a Masters runner, at Peachtree on July 4th, was more successful, with a 7th overall and her first USATF Master’s championship in 33:04. Nonetheless, she was 14 seconds off of Colleen DeReuck’s 10K Master’s record. 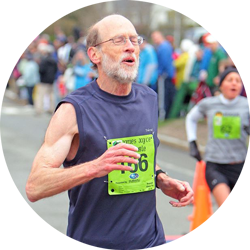 She concluded the summer with two famous road races where she won Master’s Championships, the Utica Boilermaker 15K where she finished 7th overall in 52:21, and the Falmouth Road Race [7 miles] where she finished 11th overall in 38:12. Can she get the American record? It is not clear. The record of 15:48 is currently held by the incredible runner, Colleen De Reuck, who set the record a decade ago a two hour’s drive to the east in Albany, NY. DeReuck holds almost all of the American Master’s records for women from the 5K to the Marathon. The course record is another story. Even if Rhines should come up short in her quest for an American Master’s record, the results suggests she is almost certain to take down the Master’s course record. Interestingly that record was set by Stephanie Herbst-Lucke in winning the Women’s 45-49 title 3 years ago in 16:37. Rhines will surely return that honor to the 40-44 year old group. As I indicate above, Rhines was off of De Reuck’s American record setting pace when she ran the 10K in Atlanta. Can she surpass DeReuck on October 5th? In a 2012 Runners World article by Phil Latter [http://www.runnersworld.com/elite-runners/jen-rhines-last-stand], Terence Mahon is quoted as saying: “The training for Jen is somewhat secondary to the desire. If she is excited to do the 10K, then we make that the focus of the workouts. The same goes for the marathon or the 5K.” As no other race results are posted for Rhines since August, I infer that Rhines is peaking for the 5K in Syracuse and has made it her chief focus in these closing weeks of her training. Let’s hope that works out well for her; she certainly seems to be motivated and has shown in the past that she can rise to the occasion. Her 2014 results suggest that the American record of 15:48 is a worthy goal that is within reach but is by no means a soft target. Breaking the record would be a major achievement. Getting lots of supporters out for the hometown heroine’s quest should help.